British chinchilla kittens for sale. Cats available. Standarts of British shorthair. GENERAL: the British Shorthair is compact, well-balanced and powerful, showing good depth of body, a full broad chest, short to medium strong legs, rounded paws, tail thick at base with a rounded tip. The head is round with good width between the ears, round cheeks, firm chin, medium ears, large round and well-opened eyes, and a medium broad nose. The coat is short and very dense. Females are less massive in all respects with males having larger jowls. This breed takes a full 3-5 years to reach full maturity and development. Individuals should convey an overall impression of balance and proportion in which no feature is exaggerated to foster weakness or extremes. HEAD: round and massive. Round face with round underlying bone structure well set on a short thick neck. The forehead should be rounded with a slight flat plane on the top of the head. The forehead should not slope. NOSE: medium, broad. In profile there is a gentle dip. CHIN: firm, well-developed in line with the nose and upper lip. MUZZLE: distinctive, well-developed, with a definite stop beyond large, round whisker pads. EARS: ear set is important. Medium in size, broad at the base, rounded at the tips. Set far apart, fitting into (without distorting) the rounded contour of the head. EYES: large, round, well opened. Set wide apart and level. BODY: medium to large, well knit and powerful. Level back and a deep broad chest. LEGS: short to medium, well-boned and strong. In proportion to the body. Forelegs are straight. PAWS: round and firm. Toes: five in front and four behind. TAIL: medium length in proportion to the body, thicker at base, tapering slightly to a rounded tip. COAT: short, very dense, well bodied, and firm to the touch. Not double coated or woolly. COLOR: for cats with special markings: 5 points for coat color and 10 points for markings. Shadow tabby markings in solid color, smoke, shaded, shaded golden, bi-color, or calico kittens are not a fault. *The previously listed penalties and disqualifications apply to all British Shorthair cats. Additional penalties and disqualifications are listed under colors. 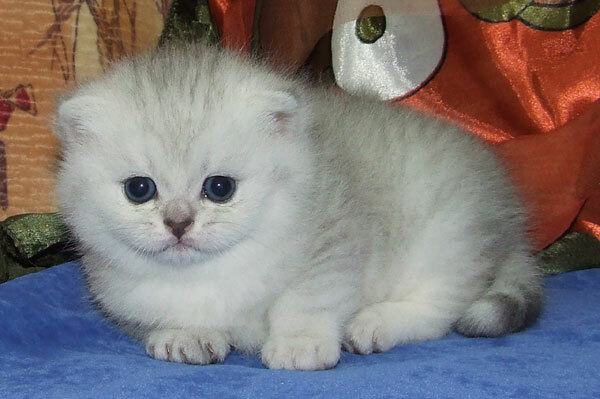 BRITISH SHORTHAIR COLORS WHITE: pure white, untipped with yellow. Eye color: deep sapphire blue, gold, or copper. Odd-eyed whites shall have one deep sapphire blue and one gold eye with equal color depth. Nose leather and paw pads: pink. BLACK: jet black to roots, no rusty tinge, no white hair anywhere. Nose leather: black. Paw pads: black or brown. Eye color: gold or copper with no trace of green. BLUE: light to medium blue, lighter shade preferred, very level in color. Sound medium shade more acceptable than an unsound lighter shade. No tabby markings or white anywhere. Nose leather and paw pads: Blue. Eye color: gold or copper. RED: deep, brilliant red, level in color, sound to the roots. No white anywhere. Nose leather and paw pads: brick red. Eye color: gold or copper. Disqualify: heavy tabby markings. CREAM: rich cream, lighter shades preferred, level in color, sound to the roots. No white anywhere. Nose leather and paw pads: pink. Eye color: gold or copper. Disqualify: heavy tabby markings. SMOKE: a genetically silver, non-agouti tabby variety of British Shorthair. The top coat may be of any recognized solid color, tortoiseshell or blue-cream colors. The undercoat to be white or pale silver, showing maximum contrast. Nose leather and paw pads: to correspond with the coat color. Eye color: gold or copper. SHADED SILVER: a genetically silver variety of British Shorthair in which the color is restricted to the ends of the hairs in the form of tipping and the undercoat is so pale as to appear white. The coat on the back, flanks, head, ears and tail should be tipped with color. The tipping should be evenly distributed and it is the even distribution rather than the degree of tipping which is of paramount importance. Heavily tipped cats should not be penalized as long as the tipping is even and free from tabby markings; in fact, they are preferable to cats with so little tipping that they are almost white. The legs should show tipping which will decrease towards the paws, but which should be as even as possible. The chin, stomach, chest and under tail should be as pale as possible. The tipping may be of any recognized solid, tortoiseshell or blue-cream colors. Nose leather and paw pads: to correspond with the coat color. Mingled pink and/or brick red in torties and blue-creams. Eye color: gold or copper with the exception of shaded silver which is to have green or blue-green eyes only. 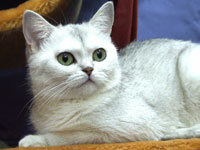 SHADED GOLDEN: the non-silver version of the shaded/tipped British Shorthair in which the undercoat is a rich warm cream color, with a mantle of black/dark brown tipping. The coat on the back, flanks, head, ears and tail should be tipped with color. The tipping should be evenly distributed and it is the even distribution rather than the degree of tipping which is of paramount importance. The legs should show tipping which will decrease towards the paws, but which should be as even as possible. The chin, stomach, chest and under tail is a pale apricot color. Nose leather: brick red may be outlined in black/brown. Paw pads: black/dark brown. Eye color: green or blue-green. CHINCHILLA SILVER: undercoat pure white. Coat on back, flanks, head and tail sufficiently tipped with black to give the characteristic sparkling silver appearance. Legs may be slightly shaded with tipping. Chin, ear tufts, stomach and chest, pure white. Rims of eyes, lips and nose outlined with black. Nose leather: brick red. Paw pads: black. Eye color: green or blue-green. CHINCHILLA GOLDEN: undercoat pale honey to bright apricot. Coat on back, flanks, head and tail sufficiently tipped with black to enhance a golden appearance. Legs and end of tail may be shaded with tipping. Chin, ear tufts, stomach and chest to be consistent dilute color, much lighter in tone than the undercoat color. The general effect is lighter than a shaded golden due to less tipping. Rims of eyes, lips and nose outlined with black. Nose leather: pink. Paw pads: black. Eye color: green or blue-green. SHELL CAMEO (Red Chinchilla): undercoat white, the coat on the back, flanks, head and tail to be lightly tipped with red. Face and legs may be lightly shaded with tipping. Chin, ear tufts, stomach and chest should be white. Nose leather: pink. Paw Pads: pink. Eye color: copper. SHADED CAMEO(Red Shaded): undercoat white with a mantle of red shading down the sides, face and tail. Face and legs may be a deeper shading than the rest of the body. Chin, ear tufts, stomach and chest are to be white. The general effect to be much redder than the shell cameo. Nose leather: pink. Paw Pads: pink. Eye color: Copper. CLASSIC TABBY PATTERN: markings dense, clearly defined, and broad. Legs evenly barred with bracelets coming up to meet the body markings. Tail evenly ringed. Several unbroken necklaces on neck and upper chest, the more the better. Frown marks on forehead form an intricate letter 'M.' Unbroken line runs back from outer corner of eye. Swirls on cheeks. Vertical lines over back of head extend to shoulder markings which are in the shape of a butterfly with both upper and lower wings distinctly outlined and marked with dots inside outline. Back markings consist of a vertical line down the spine from butterfly to tail with a vertical stripe paralleling it on each side, the three stripes well separated by stripes of the ground color. Large solid blotch on each side to be encircled by one or more unbroken rings. Side markings should be the same on both sides. Double vertical rows of buttons on chest and stomach. Penalize: brindling. Disqualify: white anywhere. MACKEREL TABBY PATTERN: markings dense, clearly defined, and all narrow pencillings. Legs evenly barred with narrow bracelets coming up to meet the body markings. Tail barred. Necklaces on neck and chest distinct, like so many chains. Head barred with an 'M' on the forehead. Unbroken lines running back from the eyes. Lines running down the head to meet the shoulders. Spine lines run together to form a narrow saddle. Narrow pencillings run around body. Penalize: brindling. Mackerel pencillings not in evidence on both sides of the cat. Disqualify: white anywhere. SPOTTED TABBY PATTERN: good, clear spotting is essential. The spots can be round, oblong, or rosette-shaped. Any of these are of equal merit but the spots, however shaped or placed, shall be distinct. Head: as classic tabby. Body and Legs: good, clear spotting essential. Tail: spots or broken rings desirable. Color: silver with black spots, brown with black spots, red with deep rich red spots. Any other recognized ground color acceptable with appropriate spotting. Eye color: as for classic tabby. Penalize: solid spine color line, brindling, markings not distinct and separate or spotting not in evidence on both sides of the cat. Disqualify: white anywhere. SILVER TABBY (classic, mackerel, spotted): ground color, including lips and chin, pale clear silver. Markings dense black. Nose leather: brick red. Paw pads: black. Eye color: green or hazel. SILVER PATCHED TABBY (classic, mackerel, spotted): ground color pale, clear silver. Markings desne black, with patches of red or softly intermingled areas of red on both body and extremities. Nose leather: brick red. Paw pads: black and/or brick red. Eye color: brilliant gold, green or hazel. SILVER PATCHED TABBY AND WHITE (classic, mackerel, spotted): same as for silver patched tabby with the addition of white. Blaze desirable. Nose leather: brick red and/or pink. Paw pads: black, brick red and/or pink. Eye color: brilliant gold, green or hazel. RED TABBY (classic, mackerel, spotted): ground color red, including lips and chin. Markings deep, rich red. Nose leather and paw pads: brick red. Eye color: gold or copper. BROWN TABBY (classic, mackerel, spotted): ground color brilliant coppery brown. Markings dense black. Lips and chin of same shade as the rings around the eyes. Back of leg black from paw to heel. Nose leather: brick red. Paw pads: black or brown. Eye color: gold or copper. BROWN PATCHED TABBY (classic, mackerel, spotted): ground color brilliant coppery brown. Markings of dense black. Patches of red or softly intermingled areas of red on both body and extremities. Nose leather: brick red. Paw pads: black and/or brick red. Eye color: gold or copper. BROWN PATCHED TABBY AND WHITE (classic, mackerel, spotted): same as for brown patched tabby with the addition of white. Blaze desirable. Nose leather: brick red and/or pink. Paw pads: black, brick red and/or pink. Eye color: gold or copper. BLUE TABBY (classic, mackerel, spotted): ground color, including lips and chin, pale bluish ivory. Markings a very deep blue affording a good contrast with ground color. Warm fawn overtones or patina over the whole. Nose leather: old rose. Paw pads: rose. Eye color: gold or copper. BLUE PATCHED TABBY (classic, mackerel, spotted): ground color pale bluish ivory. Markings of very deep blue affording good contrast with ground color. Patches or softly intermingled areas of cream on both body and extremities. Warm fawn overtones or patina over the whole. Nose leather: old rose or pink. Paw pads: rose and/or pink. Eye color: gold or copper. BLUE PATCHED TABBY AND WHITE (classic, mackerel, spotted): same as for blue patched tabby with the addition of white. Blaze desirable. Nose leather: old rose and/or pink. Paw pads: rose and/or pink. Eye color: gold or copper. 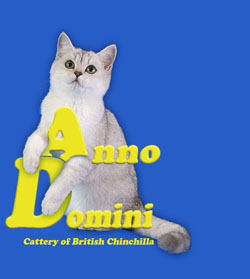 CREAM TABBY (classic, mackerel, spotted): ground color, including lips and chin, very pale cream. Markings of buff or cream sufficiently darker than the ground color to afford good contrast, but remaining within the dilute color range. Nose leather and paw pads: pink. Eye color: gold or copper. 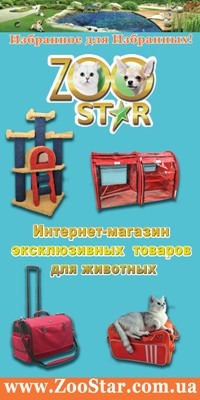 TABBY AND WHITE (classic, mackerel, spotted): red tabby, cream tabby, blue tabby, silver tabby, brown tabby with white. Where the tabby pattern is expressed the pattern should conform to the already established tabby pattern requirements, with allowances for the expression of white. As a preferred minimum, there should be some white on the feet, legs, undersides, chest and muzzle. Less white then this should be penalized proportionately. Symmetry of those markings, no matter the amount of color vs. white, is desired. White blaze desirable. Nose leather, paw pads, eye color: to conform to the already established tabby requirements; nose leather and paw pads may also be pink. VAN TABBY AND WHITE: white cat with colored portions confined to the extremities; head, tail, and legs. The colored portions conform to the currently established classic, mackerel, spotted and patched tabby color definitions. One or two small colored patches on body allowable. Nose leather, paw pads, and eye color: to conform to the already established tabby requirements; nose leather and paw pads may also be pink. TORTOISESHELL: black and rich red to be softly mingled, with both colors clearly defined over the whole animal but without any obvious patches of either color, with the exception of a short, narrow blaze which is permissible. While a single shade of rich red is desirable, the presence of two shades of red should not be heavily penalized. Nose leather and paw pads: pink and/or black. Eye color: gold or copper. Penalize: tabby markings, unbroken color on paws. Unequal balance of color. Disqualify: white anywhere. CALICO: white with unbrindled patches of black and red. Patches to be clear and defined. As a preferred minimum, the cat should have white feet, legs, undersides, chest and muzzle. White blaze desirable. Some evidence of tabby markings are allowed in the red patches. Nose leather and paw pads: pink and/or black. Eye color: gold or copper. Penalize: brindling. DILUTE CALICO: white with unbrindled patches of blue and cream. Patches to be clear and defined. As a preferred minimum, the cat should have white feet, legs, undersides, chest and muzzle. White blaze desirable. Some evidence of tabby markings are allowed in the cream patches. Nose leather and paw pads: blue and/or pink. Eye color: gold or copper. Penalize brindling. VAN CALICO: white cat with unbrindled patches of black and red confined to the extremities; head, tail, and legs. One or two small colored patches on body allowable. Eye color: gold or copper. 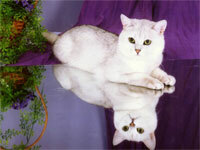 VAN DILUTE CALICO: white cat with unbrindled patches of blue and cream confined to the extremities; head, tail, and legs. One or two small colored patches on body allowable. Eye color: gold or copper. BLUE-CREAM: blue and cream to be softly mingled, not patched. Nose leather and paw pads: blue and/or pink. Eye color: gold or copper. Penalize: tabby markings, unbroken color on paws. Solid patches of color. Disqualify: white anywhere. BI-COLOR: black and white, blue and white, red and white, or cream and white. As a preferred minimum, the cat should have some white on the feet, legs, undersides, chest and muzzle. Less white then this should be penalized proportionately. Symmetry of those markings, no matter the amount of color vs. white, is desired. White blaze desirable. Eye color: gold or copper. Penalize: brindling or tabby markings. Nose leather and paw pads: to conform to the already established solid requirements; nose leather and paw pads may also be pink. VAN BI-COLOR: black and white, blue and white, red and white, and cream and white. White cat with color confined to the extremities: head, tail, and legs. One or two small colored patches on body allowable. Eye color: gold or copper. Nose leather and paw pads: to conform to the already established solid requirements; nose leather and paw pads may also be pink. OBSHC (Other British Shorthair Colors): any other color or pattern with the exception of those showing evidence of hybridization resulting in the colors chocolate, lavender, the himalayan pattern, or these combinations with white. Eye color: appropriate to the dominant color of the cat. lavender, the himalayan pattern, or these combinations with white. 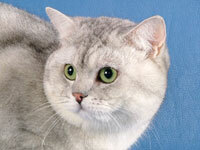 British Shorthair allowable outcross breeds: none.